Steel-framed and raised one metre, to protect from termites and water damage in the wet season. Three verandas shaded for different parts of the day and year. This house has been designed and built so the onwers can enjoying the tropical lifestyle. 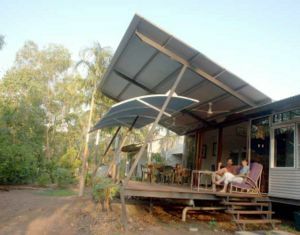 The house is located in the Humpty Doo Solar Village about 40km from Darwin. To maximise air flow the house is no more than one room deep and has few internal walls. 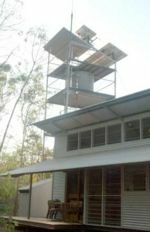 A tower houses the solar electricity system, bore water header tank and a yoga platform. This page was last modified 03:53, 27 July 2008. This page has been accessed 13,511 times.